It is estimated that up to 15% of women of reproductive age experience anovulatory cycles, which means that they are not ovulating, often without realizing. Anovulation becomes a problem when a woman is actively trying to conceive. Fortunately, this common ovulation problem can be successfully treated in the majority of cases with the right lifestyle changes, alternative approaches, and ovulation-inducing medications. Keep on reading to learn more about anovulation, its effects on your fertility, and treatment methods to stop it from standing in your way of motherhood. 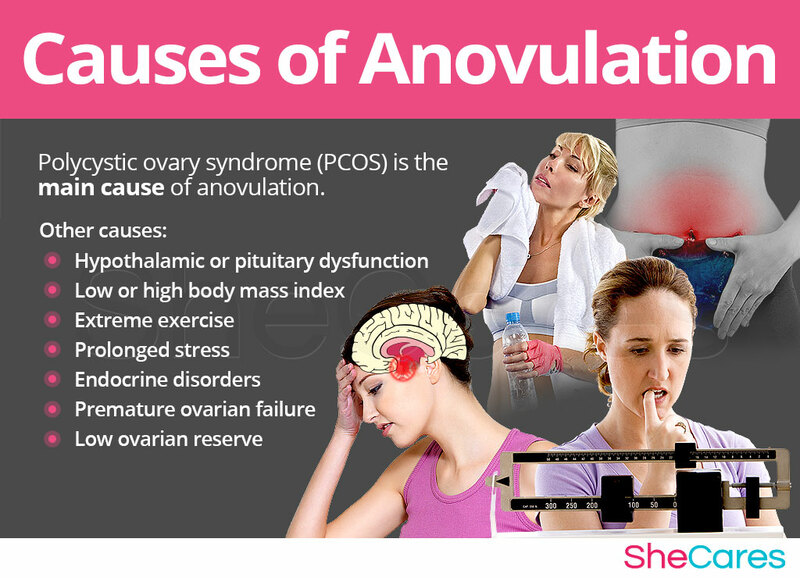 Anovulation is a type of ovulation problem when the ovaries do not produce, mature, or release an egg during a menstrual cycle. As a result, a woman is not ovulating. Sporadic anovulation is quite common in regularly menstruating women. Anovulatory cycles are also prevalent in pubertal girls experiencing menarche, the first menstrual period, as well as women entering the menopausal transition, or perimenopause. Chronic anovulation is confirmed when there is no ovulation for at least three consecutive months. It can be a symptom of numerous conditions or unhealthy lifestyle habits. Women who experience sporadic anovulation usually do not experience fertility problems. However, for those with chronic anovulatory cycles, natural conception is impossible as there is no egg being released on a monthly basis. It is estimated that up to 10% of couples of reproductive ages experience fertility issues with 40% being due to ovulation problems, such as anovulation. Fortunately, anovulatory infertility is reversible in most cases. One of the most common reasons for not ovulating is polycystic ovary syndrome (PCOS), a hormonal disorder, which causes numerous cysts in the ovaries, menstrual abnormalities, among other symptoms. Hypothalamic or pituitary dysfunction, which disrupts the productive of key ovulation hormones. It can be due to abnormal body fat, strenuous exercise, or prolonged stress. Diagnosing anovulation can be difficult because it can be a symptom of a wide range of medical conditions. An anovulatory cycle is confirmed through identification of signs and symptoms and confirmed with a number of diagnostic tests. 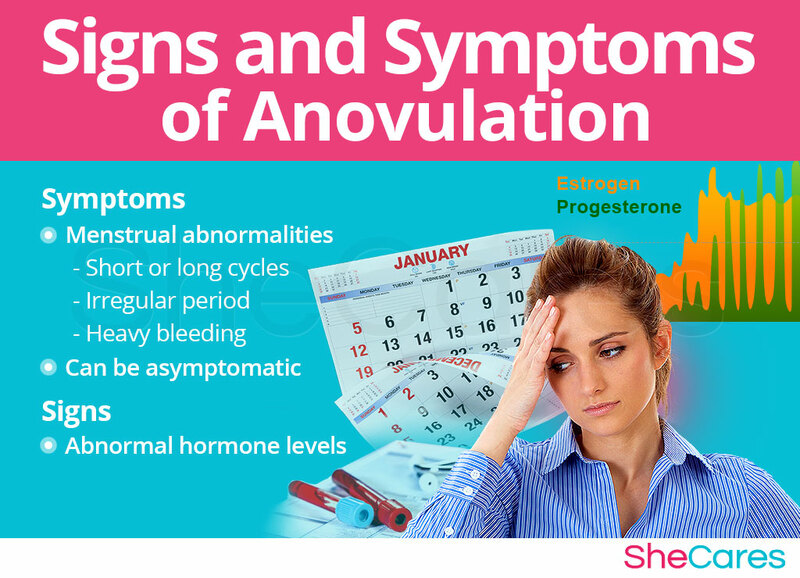 Anovulation does not produce its own signs and symptoms. There are, however, certain diagnostic characteristics that are common among the sufferers. This is the most common symptom. Because having anovulation with regular periods is still possible, many women do not know they are not ovulating until they have trouble conceiving and seek help. This is the most common sign of not ovulating. In most cases, there will be abnormal levels of key reproductive hormones, such as follicle stimulating hormone (FSH), luteinizing hormone (LH), prolactin, estrogen, and progesterone. However, the exact range of those irregularities depends upon what causes anovulation. Other physical manifestations might be triggered by anovulation-related conditions, such PCOS, which is characterized by ovarian cysts, hirsutism, or acne. The doctor will start by reviewing medical history, overall health status, and menstrual cycle patterns with a woman suspected of not ovulating. Initially, she might be advised to track her cycles with at-home ovulation tests, particularly measuring basal body temperature (BBT) or urine LH levels with ovulation test kits. An ultrasound can also give a view of the developing follicles; however, because it is costly and would require daily examinations, it is not a go-to test to diagnose anovulation. Since PCOS is the leading cause of anovulation and about a third of all PCOS women are obese, bringing body mass index (BMI) down to a normal value with diet and exercise is an essential step in resolving ovulation problems. Similarly, underweight women who struggle with eating disorders should try to healthily gain weight and reach an optimal BMI. The effects of stress on a woman's fertility should not be underestimated as it can disturb the functioning of the hypothalamus and its control over hormonal production. Efforts to relieve accumulated stress and anxiety include meditation, deep breathing exercises, and good sleep routine. Some women find relief in psychotherapy. A wholesome diet can resolve nutritional or hormonal deficiencies. It should be rich in lean protein: fish, eggs, and chicken; healthy fats: nuts, avocado, and salmon; and slow-release carbohydrates: barley and beans. Adding phytoestrogenic- and fiber-rich food products, such as flax seed or nuts, as well as full-fat dairy can promote hormonal balance. Regular, moderate-level physical activity can regulate hormonal production and help reduce obesity. Avoiding strenuous exercises, like weight lifting, and focusing on jogging, yoga, or swimming can effectively restore ovulation without the need for further treatment. Phytoestrogenic supplements, like dong quai or red clover, can regulate the lengths of menstrual phases, encourage hormone production, and support a healthy uterine lining. Hormone-balancing supplements, such as Macafem, can be effective tools for restoring ovulation and regulating menstrual cycles by nurturing the endocrine glands to produce sufficient hormone levels. They can also increase libido, making conception easier and more feasible. Acupuncture has been shown to have positive effects on female fertility and aid in the restoration of ovulation. Ovulation can also be successfully induced with medications or surgery. In many cases, ovulation can be induced with fertility pills, such as clomiphene citrate, which is the first line of treatment for anovulation. Althoughclomiphene citrate is said to be effective in 80% of the cases, some women might be prescribed other ovulation-inducing medications to use either in conjunction with or instead of it. These include human chorionic gonadotropin (hCG), human menopausal gonadotropin (hMG), FSH, among others. In some cases, when medications were not effective, surgical intervention can address the cause of anovulation. For example, women with PCOS might undergo minimally invasive laparoscopic ovarian drilling designed to trigger ovulation. Unfortunately,in cases of anovulation due to premature ovarian failure or low egg reserve, the aforementioned fertility treatments might not be effective,and using assisted fertility technologies (ARTs) to achieve pregnancy may be a better option. Anovulation, a common ovulation problem, is one of the leading causes of female infertility. It is diagnosed when a woman is not ovulating, which means her ovaries do not release an egg on a monthly basis. 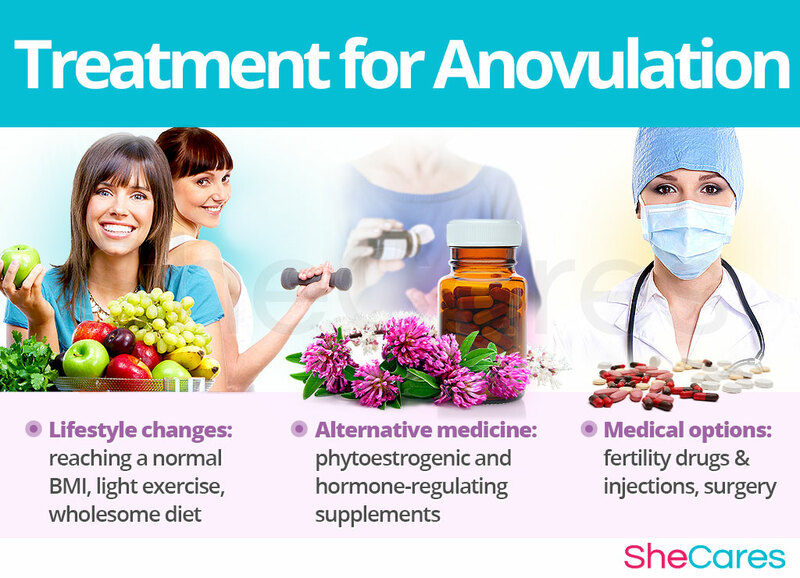 Anovulatory cycles are generally characterized by menstrual abnormalities, such as irregular periods, but it is also possible for women to experience anovulation with regular periods. Treatment generally consists of lifestyle changes, especially reaching a healthy BMI; alternative medicine, including hormone-balancing supplements like Macafem; and medications to induce ovulation. In the majority of cases, a combination of several treatment approaches can restore ovulation and a woman's ability to conceive.